Buy this item and earn 224 ClubPoints. 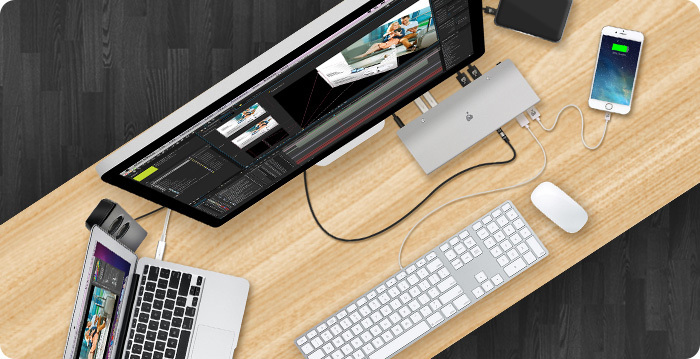 IOGEAR's Thunderbolt 2 Docking Station brings the connectivity of a desktop to your Macbook, Ultrabook, or other Thunderbolt 2 enabled devices. With its thoughtful design and ultra-sleek stainless steel body casing, GTD720 allows you to connect up to 10 devices including dual displays* so that you don't have to be restricted by the standard ports on your portable device. 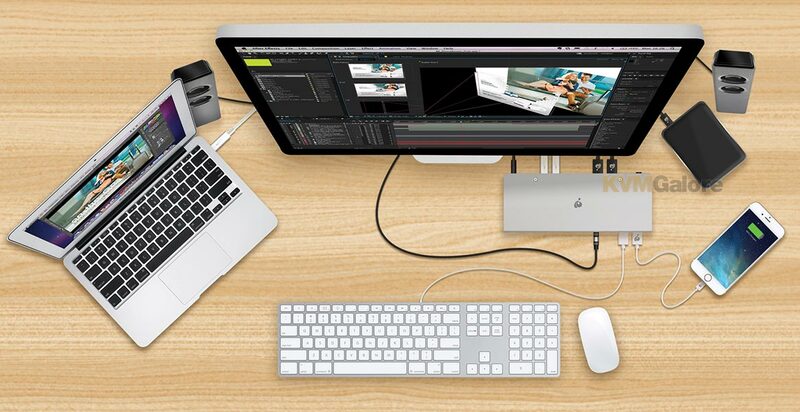 This versatile docking station connects to your device via a single Thunderbolt cable making connecting and disconnecting hassle-free. 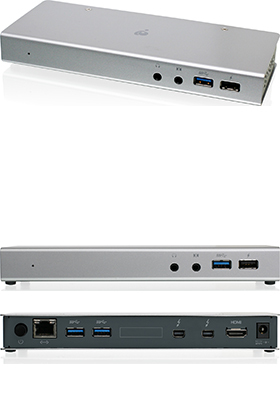 GTD720 features three USB 3.0 ports, a gigabit Ethernet port for access to a wired network connection, an HDMI port, and two Thunderbolt™ 2 ports capable of daisy-chaining up to six devices. A dedicated front-facing USB fast-charging port can charge your handheld devices even when your computer is turned off or completely disconnected, so you'll never have to turn on your computer just to charge your phone, tablet, or other device again. The front-facing optical line-in/line-out ports provide 5.1 digital audio editing and playback capabilities. All ports have been strategically placed on the dock's body to minimize visual clutter and maximize convenience, making multitasking almost effortless. GTD720 is a connectivity powerhouse. With ultra-high speed bandwidth expansion and a data transfer rate of up to 20Gbps, GTD720 will allow you to transfer data 4 times faster than USB 3.0, 40 times faster than USB 2.0 and 25 times faster than Firewire 800! With that kind of speed, you can transfer full-length HD videos in a matter of minutes. IOGEAR's Thunderbolt 2 Docking Station also supports 4K cinema resolution so you can discover the remarkable visual experience of 4K Ultra-HD (UHD). GTD720 has everything you need to knock down any connectivity obstacle in your way so you can build the ultimate workstation setup. 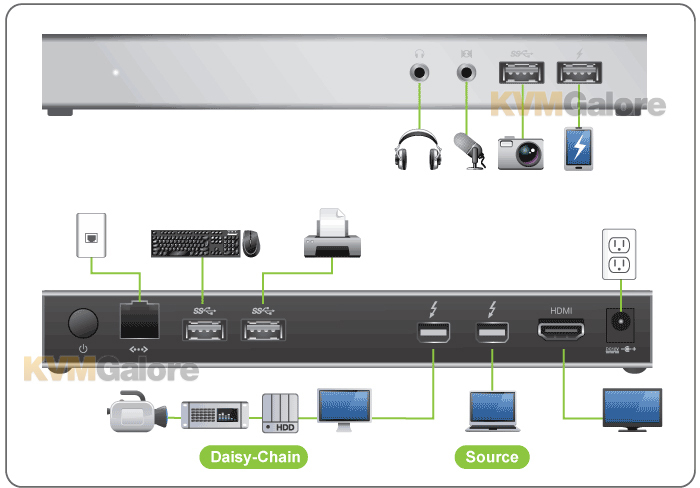 You can daisy chain up to 4 Thunderbolt-compabtible peripherals to your Mac, without any compromise on performance. 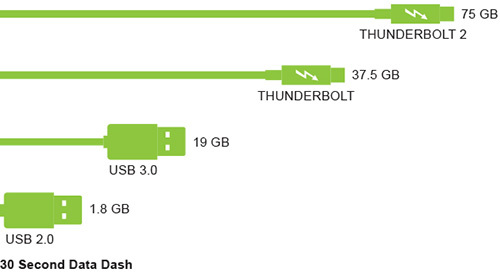 IOGEAR's Thunderbolt supports 4K (Ultra-HD) video output and high-speed file transfer simultaneously. * Note about dual displays: At least one display has to be Thunderbolt or Thunderbolt 2 technology-ready. For displays that are not Thunderbolt technology-ready, the Thunderbolt port is backwards compatible with Mini DisplayPort. 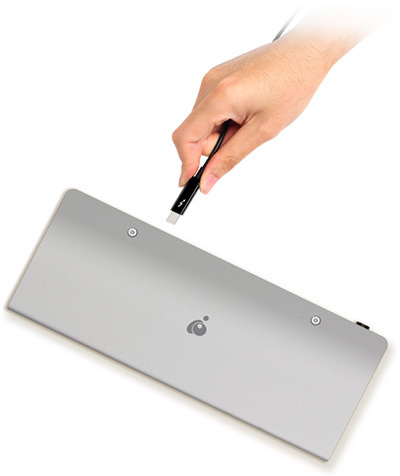 The dock supports either HDMI or Mini DisplayPort, but not both. The dock supports only one display at 4K cinema resolution.